I'm struggling with a problem with Spacemacs and I don't know what I'm doing wrong (maybe a lot of things). I have created a TAG file for my project. The tags seem to work well because I can navigate to the definition or find the tag with find-tag. 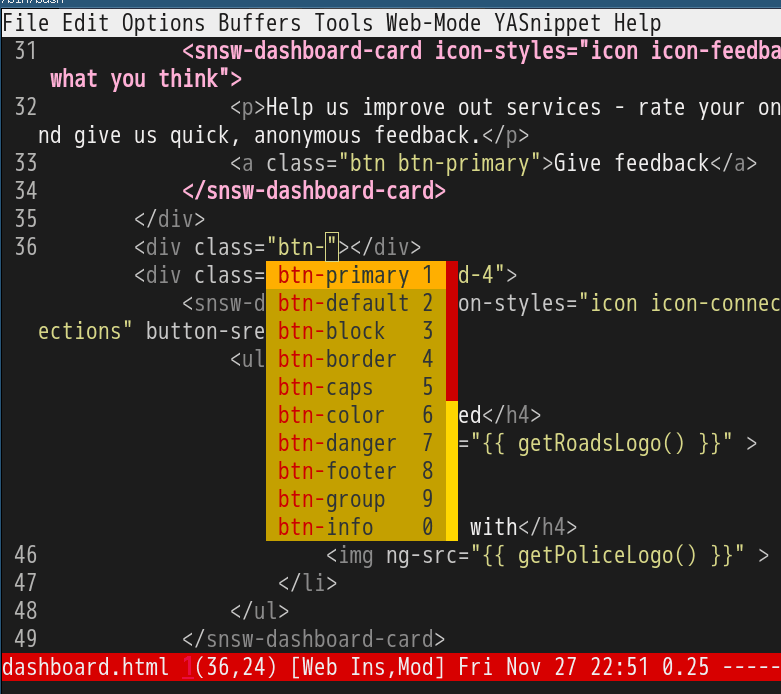 The problem is CSS autocomplete popup it's not showing. So when I'm editing an HTML file, I have not autocompletion for CSS classes. I can use helm complete at point, though. I have tried to follow the advice on this blog post but without results. I was making some tests, and I have been able to prove that the problem is that company-gtags is not enabled within a string (a class element for example). Instead I have tried company-etags and if I start the backend manually with company-beging-backend, I can see the pop up with the CSS classes. As far I can see in this github PR company-etags has an option to enable code completion on strings. But I don't know how to add it to my .spacemas. I have tried into user-config and user-init but still not working. I can finally solve my problem. Not the answer you're looking for? Browse other questions tagged spacemacs web-mode ctags or ask your own question. How can I configure company-mode to only display candidates after an explicit keypress? Does ctags know about the type of a data member in a class?